Kick off your Harry Potter festivities with this bachelorette shirt. You can change the T-shirt or vinyl color and any size you need! This gorgeous wooden guest book alternative is a fun way to welcome your guests. You can choose either from owls or hearts and any color you’d like for the frame finish. Just as a note, this lovely comes all the way from Ukraine, so make sure to give yourself a lot of time to receive it! It’s one of my favorite Harry Potter quotes and on many of these items with good reason. 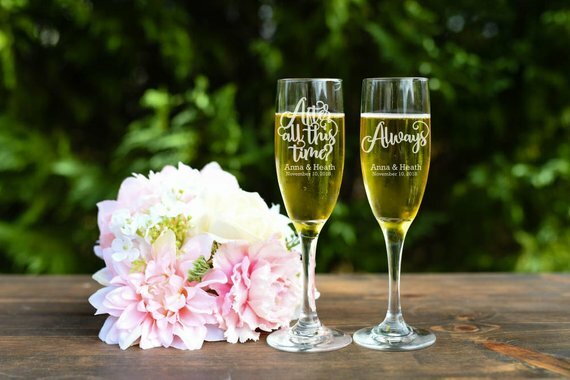 Toast to your new adventure together with these custom champagne glasses. Prop this beauty up on a table or gift it to another Harry Potter loving friend. It’s made from a solid olive wood and treated with food safe mineral oil for a shiny and beautiful finish! Maybe you don’t want to go all in on the Harry Potter theme, but your groom is obsessed. These whiskey glasses would make a fun groomsmen gift! Give one to each groomsmen or splurge and get them all the whole set. These beautiful wooden spoons are a fantastic bridesmaid gift to throw in your bridesmaid tote gift bag! You can choose from 3-6 spoons with whatever combination of sayings or designs. Pair your Muggle to Mrs shirt with this pretty wine label and you have a perfectly magical night ready! You can either print it at home or have this printed for you and can choose the background color, too. Don’t forget the sunglasses, obviously. These would work for your bachelorette bash or the reception! You can have them customized with whatever you want on the side with your choice of color. Stamp your wedding invite envelopes or favor tags with these beauties! Customize with your names and you also receive a proof before printing to make sure you love the way it looks. They also offer a larger set with more Harry Potter-themed stamps, too! This Marauder's Map invite is everything. They’re personalized to your names and open in several different ways to mimic the real deal. They’re about $5/each (the price is listed in pounds) which is a very affordable deal for something so intricate. RSVP cards and sample invites are also available! Decorate the back of your wedding chairs with these beautiful wedding signs. The beauty of these guys is you can also use them as props for wedding photos and hang in your home after the wedding! This gorgeous cake topper detail is perfect if you want a full-out themed wedding or just a nod to the epic story. It’s lightweight and comes in a keepsake box so you can keep it for years to come! Shipping is also fast - it only takes 1-3 business days to get out. Decorate the tables with these confetti pieces. Taken straight from the books, this confetti will make any table or wedding aisle come alive with the magic. You can choose hearts or stars and various amounts. Here’s another guest book alternative with more personalization. Get your name personalized on the front and encourage guests to write their well wishes on the hearts. This stunning book would make perfect decor for your reception! Place it on the head table or near the guest book as an intricate decoration. Best part is that you can keep this beauty for years to come! Create a moody setting with these black and white tapered candles. You can choose from several different colors and quantities to create an atmosphere just like the Great Hall. Let your little ring bearer walk down the aisle with this Harry Potter inspired ring box. Choose from several different wood colors and engravings on the side. It’s a perfect keepsake for the Harry Potter fan! Remember the scene where Hermione grabs her fancy necklace and all is revealed that she can actually travel back in time?! Although we mere Muggles can’t do that (whatever), this gorgeously intricate necklace will at least make you feel pretty. It’s a long necklace (25 inches) and the pendants is only 1.8 inches in diameter. You can also choose choose the color of sand and gold. It would be a beautiful addition to any wedding or rehearsal dress. These dainty little earrings are a perfect nod to the Deathly Hallows. They’re made out of gold filled wire, sterling silver square wire and raw crystal quartz. It’s a gorgeous detail for your wedding day or rehearsal! To celebrate your nuptials, these adorable 100% cotton pillowcases will do just the trick. Can my dining room table always look like this? Decorate each of your tables with runners corresponding to each school. As we all learned, Slytherin isn’t all bad, so there’s no harm in throwing an emerald runner on a table, especially one this gorgeous! This seller also carries several other colors, too! Create a moody and mysterious setting with these lanterns. Attach them outside to light the path to the reception and get your guests ready for a magical evening. These lamps create a flicker effect which will only help create the mood. These skeleton keys bring back memories from the very first book when Harry had to catch a flying key to find the Sorcerer’s Stone. Decorate your reception tables with these beauties! Get your guests to sign your guest book the old-fashioned, Harry Potter way with this quill. It comes with a pretty pen holder, as well, so it looks nice in between signings. And of course, make sure to get your guests in on the fun! These plastic Harry Potter glasses are the perfect way to get your guests laughing. Use them as props for the photo booth or encourage your guests to wear them all night long for some hilarious photos.